A personalized summer romance with 13 possible endings! Summer is all about relaxing and having fun. In this original romance, you get to choose how to find your happy ending, which can result in a kiss from one of eleven swoon-worthy guys. At the end of each chapter, you decide how to continue your journey to find love, and the endings are based entirely on the choices you make while reading. Every selection counts and the possibilities are endless. Not ready for romance? No problem! There are different endings to satisfy every reader, so you’re guaranteed one fabulous beachside summer! 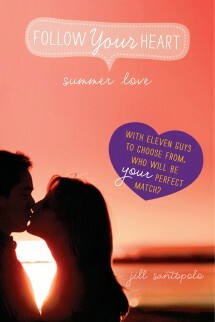 Flirty, fun and filled with swoon-worthy boys—this book is the perfect summer escape. Someone get me to the beach! This book will last you endless days on the beach, by the pool, or reading on the couch. Yes, it’s pretty much the perfect book to add to you reading list this summer. Ideal for fans of Sarah Dessen and Gayle Forman…this is a diverting prescription for summer-vacation reading.